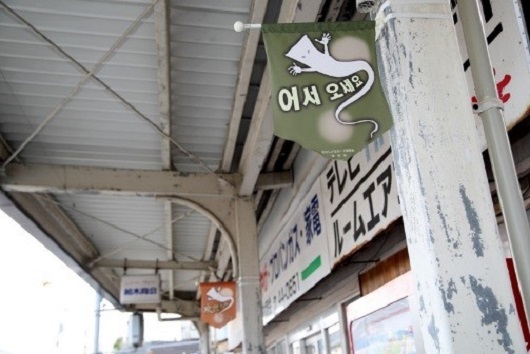 Tottori prefecture's Sakaiminato attracts many tourists as a town associated with yokai, the ghosts, goblins, monsters, and otherworldly creatures of Japanese lore and legend. Yokai are actually invisible, but along the 800-meter Mizuki Shigeru Road leading out of the Sakaiminato railway station, visitors encounter statues of the yokai given physical form by manga artist and Sakaiminato native Mizuki Shigeru (1922-2015), who is famous for his Gegege no Kitaro series. The town has managed to steadily increase and maintain its tourism industry and behind its success are the efforts by the local tourist association. Chairman of the tourist association Masuda Tomomi tells us about what the initiatives the association has led and what yokai offer as a tourist attraction. 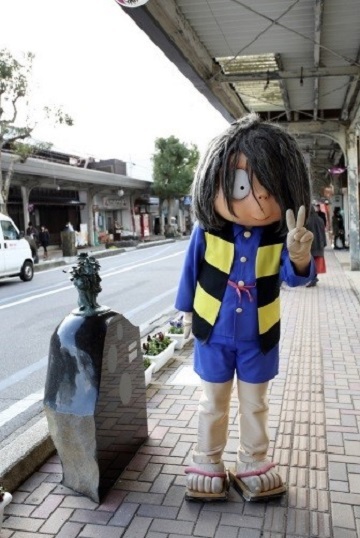 Kitaro and Medama-oyaji ("Eyeball Father") of the Gegege no Kitaro manga. 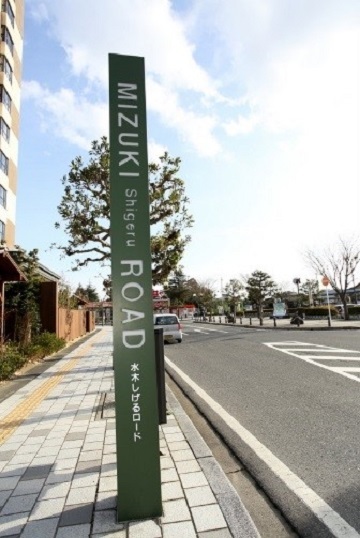 Mizuki Shigeru Road was opened in 1993. I became chairman of the tourist association in 2004, so I was not involved with the Road for its first ten or so years. 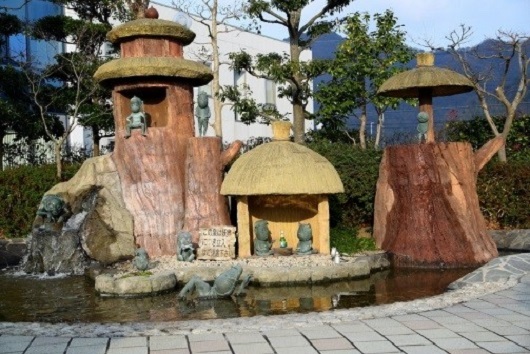 The idea of having the yokai portrayed by Mizuki Shigeru cast as bronze statues and placing them along the shopping mall as "Mizuki Shigeru Road" was a project thought up by the staff of the Sakaiminato City Hall as a means of increasing the attractions of the mall. I hear, however, that when they explained their idea, the shopkeepers along the street were all completely against it. 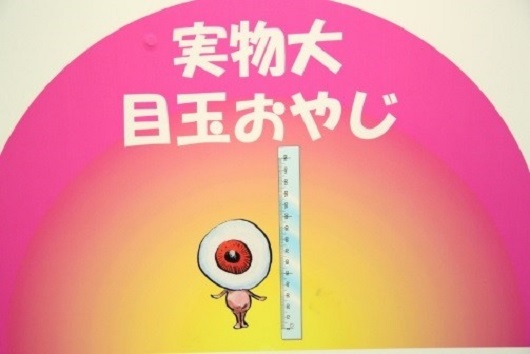 Installing statues of scary creatures like yokai--wouldn't that mean even fewer people would visit the mall!? Still, the enthusiasm of the mayor and the city hall staff for the idea eventually got across to them and the plan was carried out. The first year after the installation of the statues, there were 20,000 visitors and following year there were 14 times that many--280,000. In 2003, the Mizuki Shigeru Kinenkan museum was completed. One of the major attractions of Mizuki Shigeru Road, the museum displays the works of the artist and various memorabilia relating to him. That project, too, encountered much opposition when it was initially proposed. The main industry of Sakaiminato is fishing, and just at that time the sardine catch had dropped to a tenth the usual harvest. The industry was taking a big hit and people argued it was no time to be spending several hundred million yen on building a museum about ghosts and specters. Nevertheless, the proposal was approved and the museum was built. When the number of visitors rose from 620,000 to 850,000 the voices of opposition fell silent. The Mizuki Shigeru Kinenkan museum faces Mizuki Shigeru Road. I took office as chairman of the tourist association the year after the Mizuki Shigeru Kinenkan opened. The tourism impact of the museum had faded somewhat and the number of tourists had dropped to 780,000. What did the decrease mean? Until then I had been working in a private company and I had always had to have one eye on our sales figures. So when I saw the decrease in visitors, I instinctively felt that if we did not do something to remedy the situation, we might have a crisis on our hands. I first proposed that we should increase the number of bronze statues; at the time there were only 86. I petitioned city hall to fund the increase, but the response was that the city had finished its investment in infrastructure for the project and no more funds were available. I then decided that it would be up to us to make more statues and launched a campaign calling for sponsors for the statues, calling for contributions of ¥1 million per statue. The sponsor's name would be carved into the base of the statue. Dubbing them "My Yokai" we allowed the sponsors to choose which yokai would be carved for the statue they sponsored. Sometimes I would be asked to introduce a suitable yokai for a sponsor's statue. So, for example, for a local credit union service, I suggested "Hyotoku." This auspicious yokai is known for producing money when its belly button is rubbed. Then, when the transport company where I had previously worked offered to sponsor a statue, I suggested "Iju," a yokai that protects the transport of freight. Fits perfectly, right? Both sponsors were very happy with these choices. Within one month of launching the campaign, we had 29 sponsors. About 60 percent were individuals, and included one person who supported the installation of three statues. 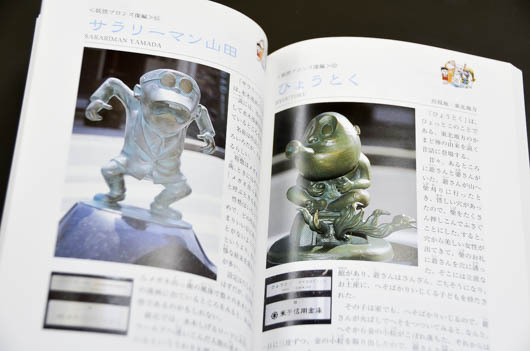 In 2012 we again increased the number, and today there are a total of 153 yokai bronzes populating the shopping mall. These bronzes form the basic infrastructure of our local Mizuki Shigeru world, and the increase in their number has kept the crowds coming to Sakaiminato. I might mention that I got the idea for the sponsor-a-statue campaign on a trip I took to the ruins of Pompei, in Italy. When you visit Pompei, you find that there are a number of large baths in the city, I found people's names inscribed on the blocks of marble forming the baths, and it stuck in my mind. As you can see, wherever I go, I am looking for ideas that can be useful to us in our efforts. From then on, too, whenever I had an idea for a project, I've followed the policy of raising money for it myself. When you try to do something through the local government, invariably it takes a lot of time. Once you decide to do something, I think it is important to do it as soon as possible. Also, as I often say, "If we just say 'it can't be done,' we'll never do anything; let's just do it." To put it the other way around, it is probably difficult to say that something really "can't be done." If you have tried a hundred times or ten thousand times and failed, then maybe you can say "it can't be done"--but no, I don't think you should say it even then! Those who are so quick to say "impossible" are just not doing anything to make something happen. 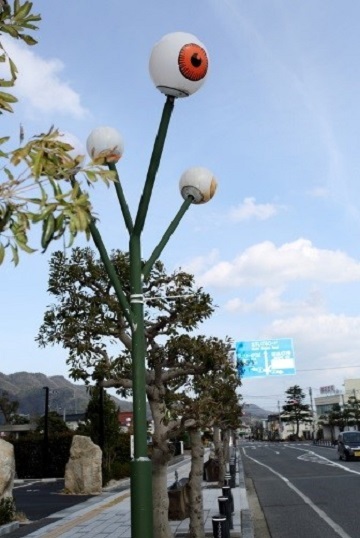 After the bronze statue campaign, we organized a whole series of different kinds of events: inviting designs for yokai-themed streetlights, setting up certification for expertise on yokai, soliciting humorous senryu verses on the theme of yokai, holding a yokai look-alike contest, and so forth. Since I became chairman, we have held around 200 events, large and small. When you have a series of events going on, eventually you catch the attention of the media. Then you do not have to use a lot of money on advertising because the effect of an article that appears in a national newspaper is about the same as an advertisement for which you might spend several million yen. I consider the reporting of Sakaiminato events on television as well as in newspapers and magazines in terms of PR expenses. We figured our "advertising" in 2004 came to ¥100 million, and in 2009 to ¥3 billion. 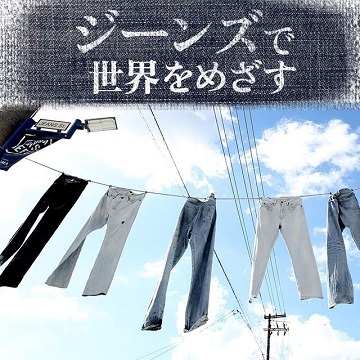 Then in 2010 when NHK broadcast the television morning drama Gegege no nyōbo [Gegege's Wife], the story about Mizuki Shigeru and his wife, our town became known all over the country, so for a while, our "advertising" was worth over ¥7 billion. It's important, you know, not to give approximate but exact figures. The same goes for the number of tourists. We have crowd-counting sensors at two locations along Mizuki Shigeru Road. So we are not just giving approximations, but actual trustworthy counts. When the numbers appear to be dropping, we can come up with a way to remedy the problem; when they increase, we can trace the reason. We can set clear objectives and determine how we will achieve them. The important thing is to be known all over the country; the visitors to Sakaiminato almost all come from other areas of the country. Thanks to the big rush of events we've held, the number of visitors has steadily grown. In 2008 they numbered about 1.72 million. In 2010 the figure rose to 3.72 million--this sharp increase was the result of the Gegege no nyobo program broadcast. In other words, 100 times the population of our town (36,000) came to visit in one year. The Gegege no nyobo effect was huge, but I am sure that it was possible because of the accumulated efforts we had made up until then. As of 2015, the yokai certification program has been held 10 times. One of biggest reasons that we have succeeded in making Sakaiminato into a tourist attraction is of course because yokai provide such an attractive subject for tourism. There is both depth and breadth to their story. Mizuki Shigeru devoted his career as a manga artist to demonstrating that yokai and ghosts don't have to be consigned to the image of frightening and dreadful; they have distinctive characters, and far from being just scary, have many delightful and amusing qualities. Actually, once you get hooked on these yokai characters, it's difficult to forget them. I have to admit this is what happened to me. I only began reading Mizuki's manga after I became chairman of the tourist association, but it wasn't long before I became totally absorbed in them. There's something kind of nostalgic about them. Yokai may look grotesque and scary at first sight, but I think that beneath the surface, they represent something important that we are likely to forget. Yokai are something that are a presence in our lives; they are watching us and sometimes they appear in order to issue reminders and warnings about the things we do. When we pay attention to their presence, we are reminded of something important that we have allowed ourselves to forget. Yokai, I would say, are a kind of healing presence. Masuda with life-size statue of Nezumi Otoko (Rat Man). One thing I have noticed is that yokai fans span the generations--from small children even to older folks. You can see this just looking at the age of the people who sign up for the yokai certification program we have been running since 2006. The youngest to take the test was four years old and the oldest was 75. At first we only had one level (Beginner level) of certification, but now we have Beginner, Intermediate, and Advanced levels of the test. It really caught me by surprise when the four-year-old passed the Beginner level in 2015. 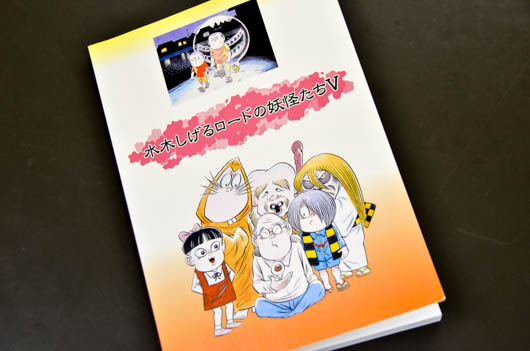 The questions for the Beginning level are taken from Mizuki Shigeru Road no yokai-tachi [The Yokai of Mizuki Shigeru Road] published by our association. The Intermediate level test is much more difficult, based on questions from Mizuki Shigeru's Nihon yokai taizen [Compendium of Japan's Yokai]. The Advanced certification we began in 2011 requires entrants to write an essay. 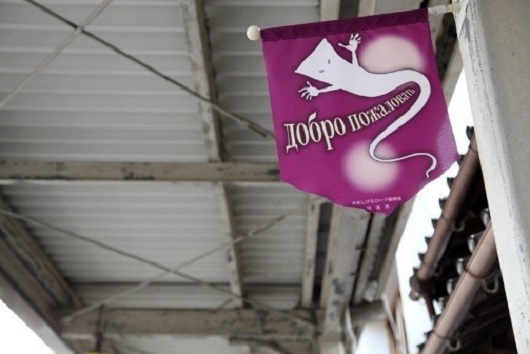 For example, we might ask them to choose between writing a proposal for community building in the city of Sakaiminato from the imagined viewpoint of a yokai or to identify and discuss extraordinary natural phenomena said to be related to yokai. Assignments like that call for considerable knowledge. We have run the certification program ten times and about 4,700 people have taken the tests. People who got interested in yokai when they were kids continue to enjoy the subject after they grow up. Mizuki Shigeru Road no yokai-tachi [The Yokai of Mizuki Shigeru Road]. Well, our dream is to make Sakaiminato a kind of mecca for folklore studies and yokai studies. 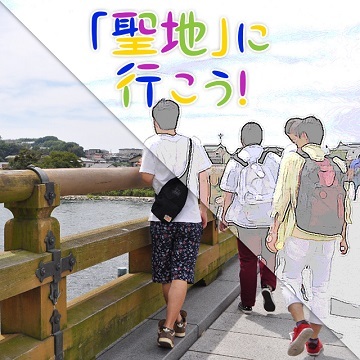 The "Kwai Forums" have been held once a year since 2012, alternately among the three cities of Sakaiminato, Tono (Iwate prefecture), and Miyoshi (Tokushima prefecture). The second cycle began in 2015 with the forum held in Tono in August. 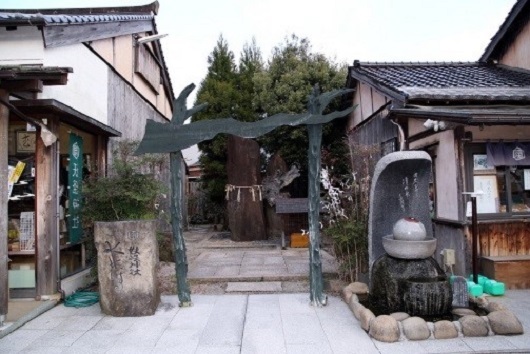 Just recently the World Yokai Association certified these three places as "kwai heritage" sites that contribute to the dissemination of yokai culture. So not only Sakaiminato but these other places have become yokai meccas, and together I am sure we can generate growing interest in yokai. Next year, we are going to launch a renewal of Mizuki Shigeru Road. The sidewalks will be widened and we plan to make it barrier free as well, with Braille blocks in the pavement and audio recordings. Also, we want to broaden our activities so as to shine the spotlight not only on the attraction of yokai but on the fishing industry here. We want to generate an image of the town associated with both yokai and fishing. Six variations of the "Kitaro Train," with cars painted with yokai characters, run on the Sakai line connecting Sakaiminato with the city of Yonago. A huge mural decorates the entrance to Sakaiminato Station. Flags that say "Welcome" in Chinese, English, Korean, and Russian hang along Mizuki Shigeru Road, and transport ships and passenger boats from China, Korea, and Russia call at the Sakaiminato port. 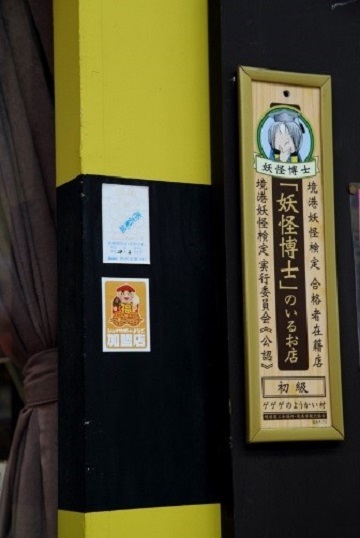 The businesses along Mizuki Shigeru Road post signs like these. 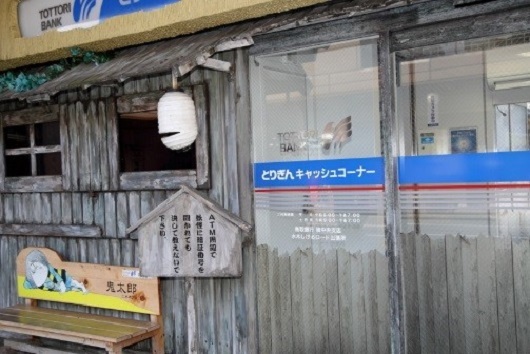 [left: Certified Yokai Expert in this Shop]; right [in front of a bank]: "Never reveal your pin number though you may be asked by a yokai in the vicinity of this ATM." 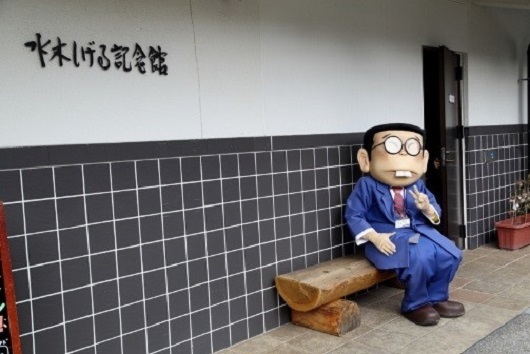 Yokai characters created by Mizuki Shigeru may unexpectedly appear here and there around town. The yokai guidebook published by the Sakaiminato Tourist Association is a best seller of over 1 million copies.